Two astronauts ventured out on a spacewalk today to make emergency repairs on a malfunctioning cooling line at the International Space Station. When we first walked on the Moon in 1969, students gathered in classrooms to watch the grainy, black and white footage of astronauts Neil Armstrong and Buzz Aldrin stepping on to the lunar surface. Today, two astronauts embarked on a spacewalk to repair a cooling line on the International Space Station (ISS), and you can watch the whole thing on live stream from NASA TV. The astronauts, Americans Rick Mastracchi and Micheal Hopkins, are working to replace an ammonia pump with a faulty valve. The ammonia pump is part of a cooling loop to maintain the temperature aboard the ISS in the vacuum of space. The pump broke down ten days ago and forced the ISS crew to shut down all nonessential equipment and put the scientific research conducted there on hold. The astronauts will likely need to perform two or even three spacewalks to complete the repairs. Canadian astronaut Chris Hadfield, former commander of the ISS, took to Twitter to comment about the repairs. Discussing the limitations of spacewalks, Hadfield writes, "Spacewalkers can't share oxygen like SCUBA divers. Each has a rebreather system and a spare tank, plus [we] can go back to the airlock. We're limited by CO2 removal, battery power, and crew fatigue. About 9 hours absolute maximum." The repairs to the cooling system pump are essential to the operation of the ISS, keeping the temperature inside the station constant despite the outside temperature ranging between 250 degrees F and -250 degrees F. Weighing in at 780 pounds and close in size to a refrigerator, the pump is even more complicated to repair due to the fluid that it moves. The ammonia used in the cooling loop is a very effective refrigerant fluid, but it can cause severe burns if inhaled or touched. The astronauts must be certain that they do not bring any traces of ammonia released during the repairs back into the ISS. 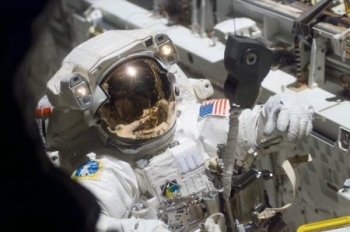 The repair plan calls for the astronauts to disconnect the faulty pump today, and then remove the old pump and replace it with a new one on Monday, December 23. If the work can't be completed in the second spacewalk, a third spacewalk is planned for December 25. If the third spacewalk goes ahead, it would be the first Christmas spacewalk ever. You can watch the repairs and listen to the commentary live from the astronauts and NASA live on NASA TV.